Paeonia Carl G. Klehm is the ultimate rose-shaped peony variety. The white petals have some slight hints of pink. The buds can grow about 50 mm wide, and open up to flowers that are 20 cm in diameter. They are carried by thick stems with solid, dark green leaves. This variety is bred by Roy Klehm as a tribute to his father Carl G. Klehm. Definitely one of the most famous peony breeders in the world. Although he bred a large number of classic peonies, he never named a variety after himself. 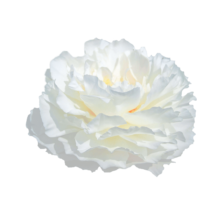 Carl G. Klehm will be added to our assortment of lovely peonies in 2020. We can guarantee you it will be worth the wait!